My dear unemployed friends, what better way to improve your wardrobe than to swap out your tired old clothes for someone else's? 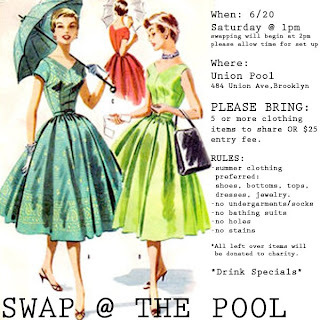 MatchGirl's girlfriends are hosting a clothing swap tomorrow at Union Pool in Williamsburg. *no undergarments, socks, bathing suits, etc. *accessories count too! shoes, jewelry, etc. *show up at 1pm so that we can sort everything into areas. *bring at least 5 items, coupons will be given out for up to 10.
all leftovers will be donated. if you have items that don't qualify please bring and they will be donated. union pool will have drink specials and the taco truck will be open. i didn't specify that this is for the ladies, but if you know boys that want to donate let them know. if we have enough show up we can include them, if not their items will go to charity.